On Friday I attended my first Creative Morning Charlotte event. I also used this as an excuse to take my first ride on the Blue Line. I felt like I was traveling without leaving home! This morning's gathering was focused on the theme Community. Andrew Au of Digital Charlotte spoke about our local digital divide. The big idea of his talk was that 'Community Creates Opportunity' but also that both community and opportunity aren't just built in real life anymore. I also used this as an opportunity to try my hand at sketchnoting. 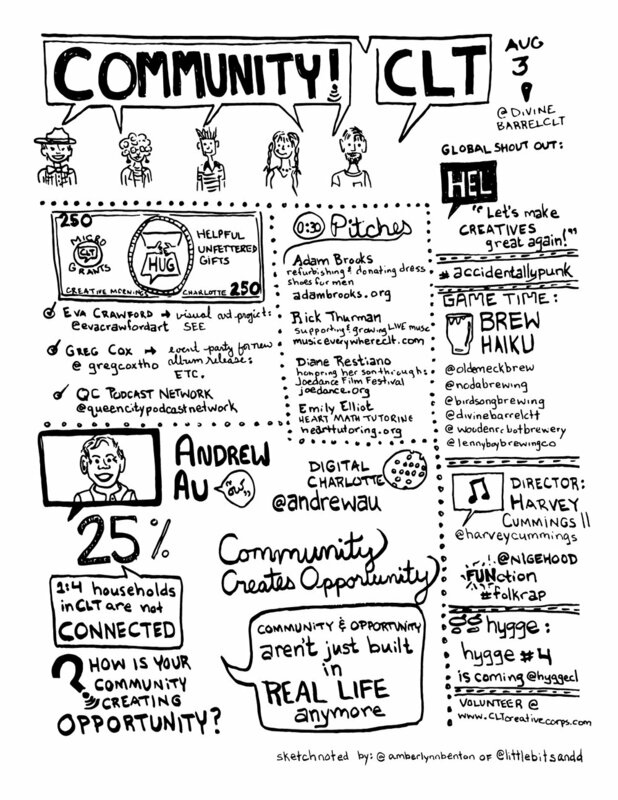 This is not a live sketchnote - I came home and polished it up a bit - but it was fun none the less. I want to keep practicing until I can build up to doing it live in ink! If you would like to learn more about sketchnoting check out Mike Rohde's book The Sketchnote Handbook.